As I sit here on Lush’s chart table all I can hear is the sound of Audrey shouting, “come on! !” as we let rip down another mid Atlantic wave! 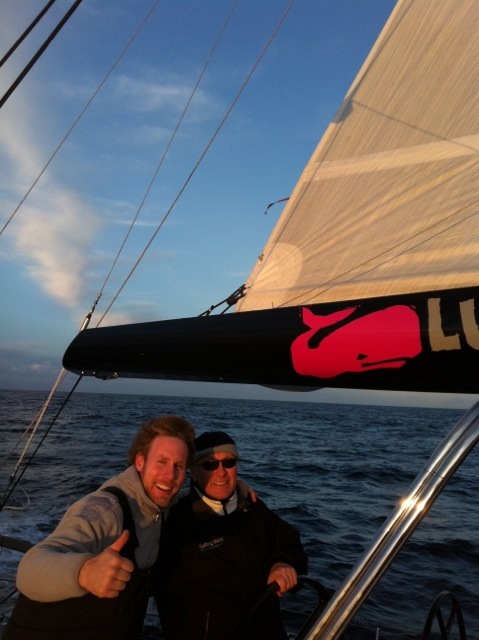 The record is 18.2 kts which smashed the previous record of 17.3! Lush is an incredible machine that when you set her up and let her go she will charge down the Atlantic and carve up the ocean as though she is being driven by a thousand pure Irish thoroughbred race horses!!! As we are an Irish yacht you will find us drinking, “Barry’s Tea” and eating freshly baked, “Odlum’s Bread” filled with Superquinn Sausages! 14.4 I just heard as Audrey, Marty & Dave try to topple the 18.2 set by Myself, Conor & Woody in the early hours of this morning! There is loads of criac onboard and I am always amazed how sailors when brought together on a yacht to cross an ocean just seem to get along great and we will always have that bond of sailing an ocean together! Fishing isn’t go so well at the mo…..we have only had one bite but he broke the line and so the stories of us hooking a shark have grown to it being a great white as it’s the only fish in the sea that could keep up with us!!! We have made 701.15 miles in 3 days! That’s an average speed of 9.7 constantly over 3 days which anyone will tell ya is great going! “lovely…16….lovely! !” just was screamed from the deck and I am now typing at about 25 degrees heel and can hear the ocean rushing past the hull and its sounds just like a waterfall that’s trying to empty a really full river!!! Despite us trucking or “sucking diesel” as Joe would say LUSH is stable, safe and never once feels as though she won’t look after us and give us the sail of our lives!!! Holy Moly we just hit 20.9 kts!!!! So our record has tumbled and Audrey, Marty & Dave are smug as hell! Alan on the sleigh ride! 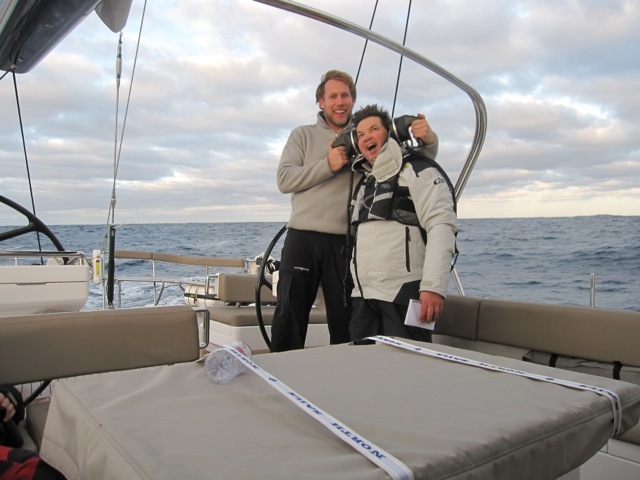 Marty, Audrey & Dave Celebrating the 20.9 knots! Today Tuesday at Noon, and we are 24 hours from cast off at Las Palmas and already we have covered 236 Nm. The winds have been up to 40 Knots – a bit more appearing on the clock form time to time! The boat is doing up to 15 knots down the rollers and is well able to maintain a steady 11 to 12 knots – amazing for a 70 tons of sleek boat. We have a total of nine on board. It is great to have crack crew for putting in the reefs, changing the jib over to goosewinging and so on. We knew from the dockside in Gran Canaria what a stunner the boat is – there was a succession of folks coming to admire her. Now we know she performs as well as she looks. It was great to have Anne McGovern on the Las Palmas dockside to wave us all the best as her husband Joe and daughter Audrey set sail. For Joe, Martin, James, Dave and Conor this the dream of a lifetime come true. These aren’t just any ‘bits and pieces’…. this was everything we thought we’d need for a round the World trip, bearing in mind that most of the places we’ll be going to are small islands with plenty of beaches and palm trees but very little in the line of shopping! ‘what-if’ list!! ‘”it’s all about anticipation,” Paul would say…. in ocean sailing we don’t want to be in a position where we’re ‘reacting’ to things going wrong. Alan (right) whipping running rigging on the hoof for reefing! We need to anticipate it before we go and have the spare part there when/if something or other eventually gives this way we can keep to our schedule and not get delayed waiting for a part to arrive in some far fetched corner of the World. We need to keep this boat on time so we don’t miss out on a weather window. Trade winds all the way baby!!! Wallis had just as big a list as Alan…. Wallis is a yoga instructor and massage therapist and has brought enough yoga kit for 12 peeps and a massage table to look after all the hard working sailors backs!! As for Paul and I … well we couldn’t go to sea for 18 months without bringing our Kites and boards etc.. for some kite surfing in pretty cool spots! There’s various other bits of waterspout toys packed away onboard. Paul got some massive lines for the Panama canal to tie Lush alongside and in excess of a few hundred charts along with a load pilot books and manuals for every piece of electronic kit on the boat. And then there was all the galley equip and food provisions…… I had 12 boxes of galley equip which I fitted between 4 cupboards in the galley!! It’s unreal how the boat just swallowed up all of our stuff. We reckon we’ve put 4 tones of kit on the boat between everything and the majority of this stuff is stowed under the floorboards, in the bilges and under any side lining in the boat!! I spent (along with my Mums help!) about 12 hours food shopping over 4 days so that we’d have all the ingredients necessary to tackle any fancy recipes when we get to the Caribbean and beyond! For the two main passages to the Caribbean (the 8 day Las Palmas one and the 14 day Atlantic one) I cooked up most of the dinners in advance, vac-packed and frozen them. We just don’t have the storage space to make dinners up from scratch and it generates a load of rubbish, which we then have to stow on the boat till we reach land, so cooking in advance is the way to go and in fairness ‘tis a lot easier to reheat some grub then start chopping and preparing food in big swell at a 45degree angle! Obviously I did get a load of fresh fruit and salad to keep us reasonably healthy afloat!! For the 6 days of packing Lush we didn’t stop once…. It was like a full on game of tetras (you know the game you’d have played on your first phone/computer). You’d fit something into a space and then turn it into a million different positions so that the space could be used to its maximum. Wallis’s mum Sarah, Alan’s two daughters, Amber and Cori along with his wife Kizzy worked flat out with us for 5 days solid. My parents arrived at the weekend and they were put to work straight away. Collect Goode joined us on the Monday night and definitely noticed the difference between this and the Sailing West Fastnet campaign last year onboard our reflex 38’, which didn’t even have a cooker!! 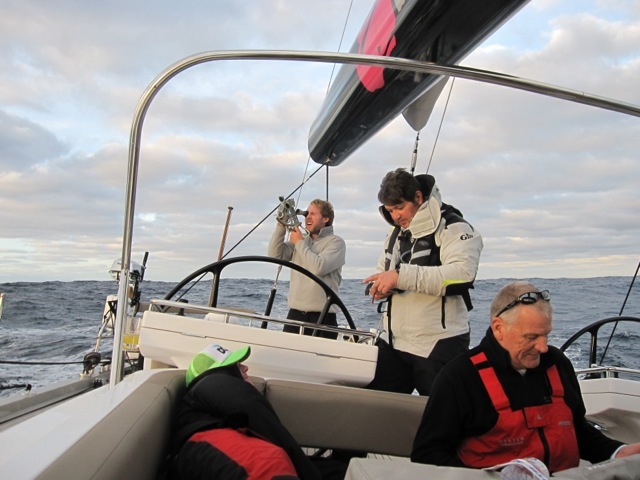 Collect had fractured her foot the day before the Fastnet race itself after having done all the training etc… She was gutted about it at the time but joining us onboard Lush for the maiden voyage to the Canaries has more than made up for it! After our months of sorting, organizing and packing ‘twas just mighty to finally set sail on the 14th of Nov! The trip down was ideal with calm seas and a light easterly breeze initially and then building to 30knots from the North, lovely! 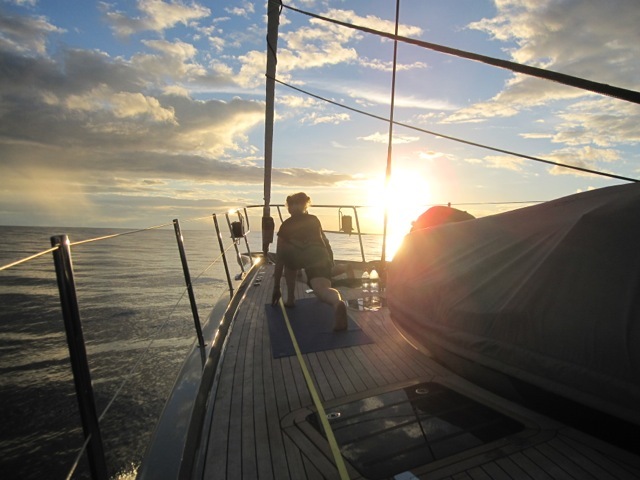 The last few days were calm again with a bit of a swell and we had managed to peel our layers daily finally finishing in Las Palmas with shorts and t-shirts, a bit of a change from all the thermals, mid layers and heavy weather oillies in Biscay! We worked a 3hour watch system with 6 hours off and then two ‘happy hour’ sessions a day where all crew would be on deck together for lunch, dinner and our daily dance class with Wallis to keep us all active!!! Now that’s some sight, eight of us dancing around the aft deck! Classic! Paul & Alan – Alan needed a jump start! Paul with Audrey’s Dad Joe! Wallis & Audrey doing Yoga on the bow! 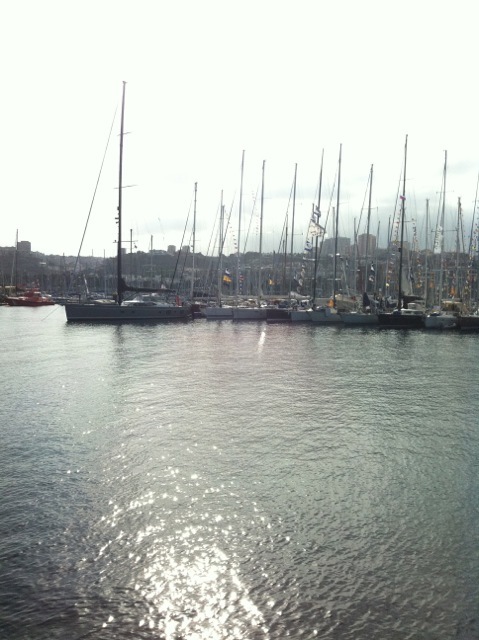 LUSH Parked in Las Palmas amongst the ARC yachts!